So the #giftalong2014 sale happened last week and it went quite well for me – a good few sales generated because of it for me, and I’ll definitely be participating again next year, if the lovely organisers hold it again – sure looked like a lot of work from over here! Thank you, if you happen to read this! One of my fellow designers, Dani Berg, was also participating in the giftalong, and I took the opportunity to ask her some questions about her work. When and where do you get a chance to design: what’s your day like? I mostly design in the afternoons. After I’m done with my day job and pick up the kids from school, but before dinner. I knit on designs in the evenings as well. What pattern are you most proud of and why? I’m really proud of the Snowscape shawl. It was knocking around in head for almost 2 years before I was finally able to have it look exactly the way I envisioned it. What’s your best selling pattern? Did you have a feeling it would do well or was it a surprise? 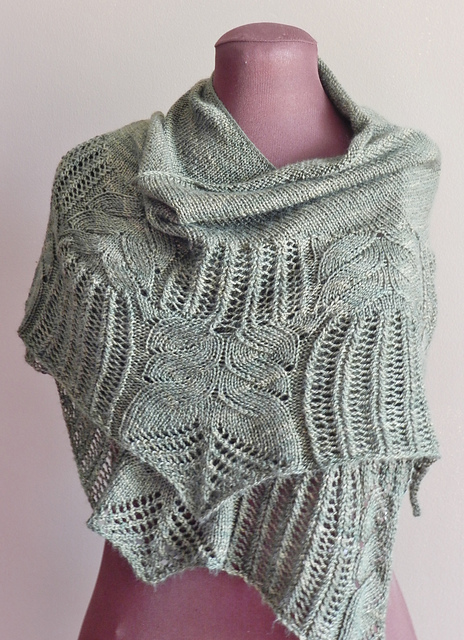 The Serendipity Ear Band is far and way my best seller, although the Harvest Fling Shawl is catching up! I never expected it be as popular as it is, but I’m very pleased and grateful. There’s a thread in the designer’s forum on frustration. What frustrations have you had? Time. Time is biggest frustration. There’s never enough to accomplish all I wish I could, plus spend time with my family. What tips would you give to an aspiring designer? It takes a long time to build up a stable of patterns. Don’t rush it, quality counts! Tech editors. Get a good one! How long is your design process? Where do you start and what does it take to get it published? How do you go about working up your original idea? Sketches, swatches, see how he yarn takes you? Where do you get your ideas in the first place? If you didn’t have yarn, how would you release steam/ relax? Do you *have* any free time? I love to read, cook, bake. I generally love anything crafty. I don’t have much free time, but I try to take a little time each day for myself. Even if it’s just a few minutes to read before bed. Who have you worked with in the industry that you’d love to work with again? Who inspires you? I loved working with Stephanie Tallent on both Hitch and as my tech editor for most of self published patterns. She’s always a pleasure to work with! I hope to continue working with her for many years. Inspiration: Anne Hanson. She’s amazing. She seems to have unending well of pattern inspiration and work her is just breathtaking. I would love to meet her one day! Dani blogs at http://www.turnknit.blogspot.co.uk/ about her designs and what’s on her needles. Go take a look!